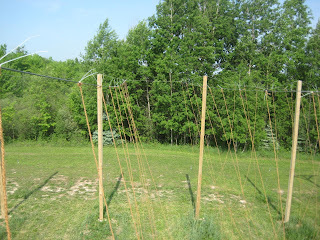 This year we decided to try using coir rope for stringing our hops. 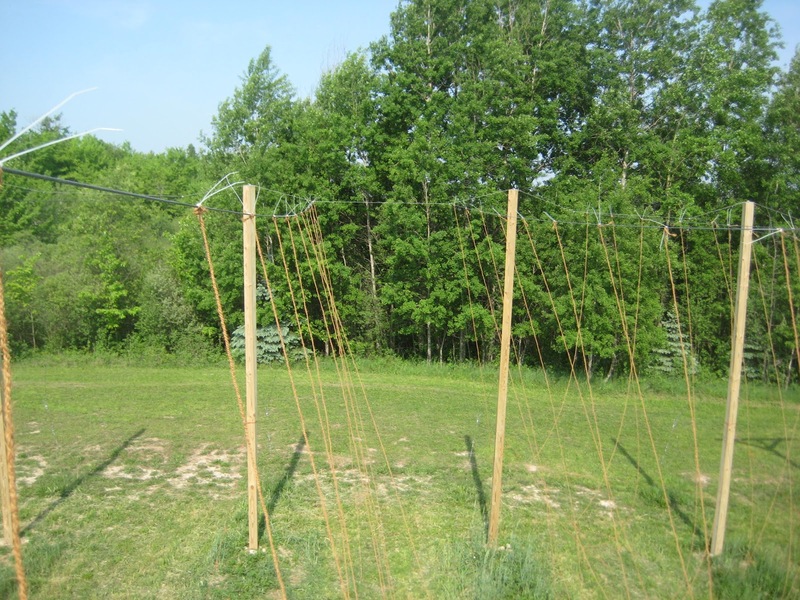 "Stringing" the hops is the term used for setting a cord in place for the hops bine to wind around and grow tall. 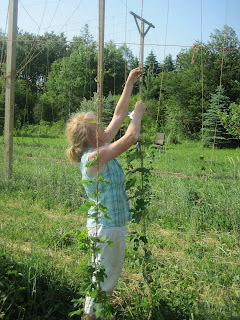 Our hops grew well over 20 feet tall last summer. 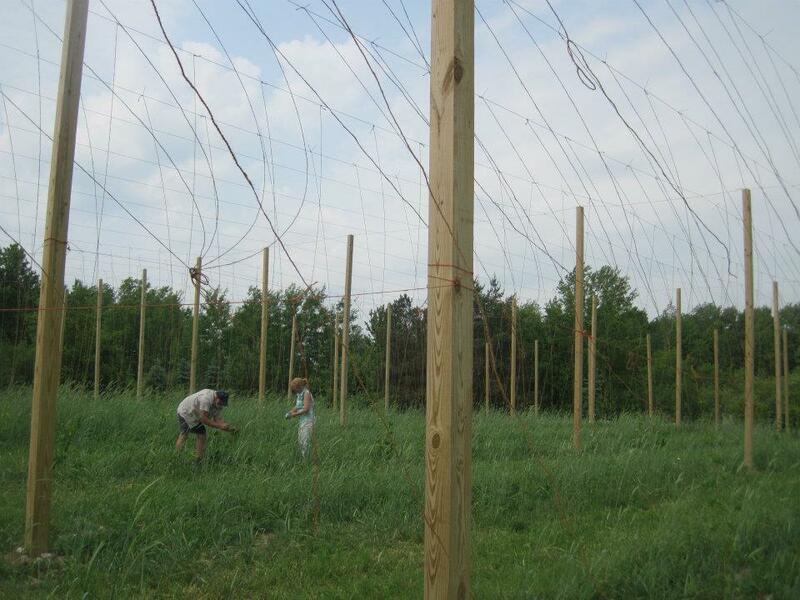 Two questions that are often asked: Do hops get cut down each year? Do you have to restring the hops each year? The answer to both is yes. Hops get cut to the ground at harvest time, lie dormant through the winter and grow vigorously again in the spring to reach stunning heights by late June. 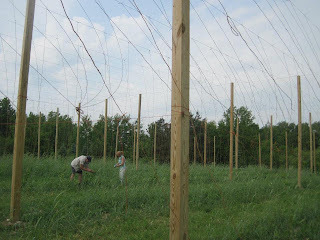 When the hops are cut down at harvest time, the entire bine, including the string upon which it grew is cut down also. 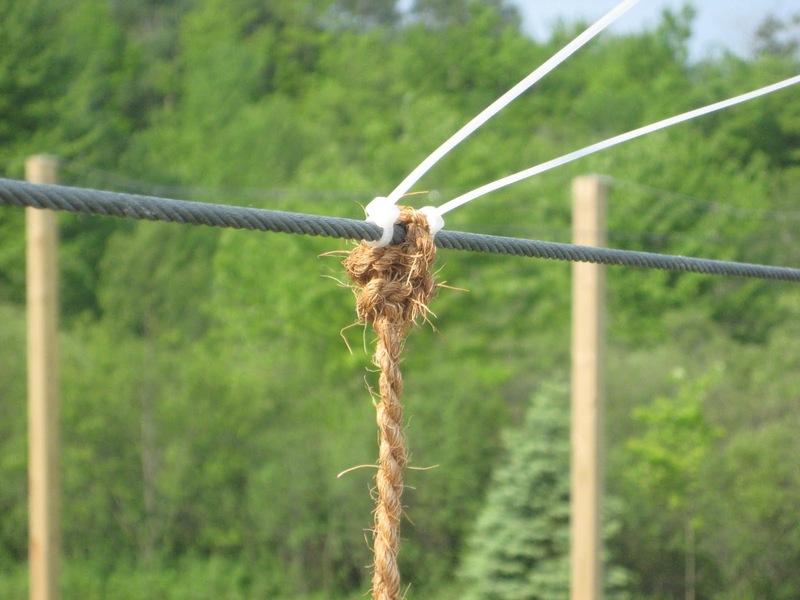 It is too time consuming and pretty much impossible to unwind the tangled bine from the string on which it grew. Coir rope is made from coconut fiber. 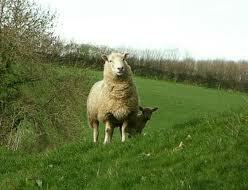 It is very coarse and thick. 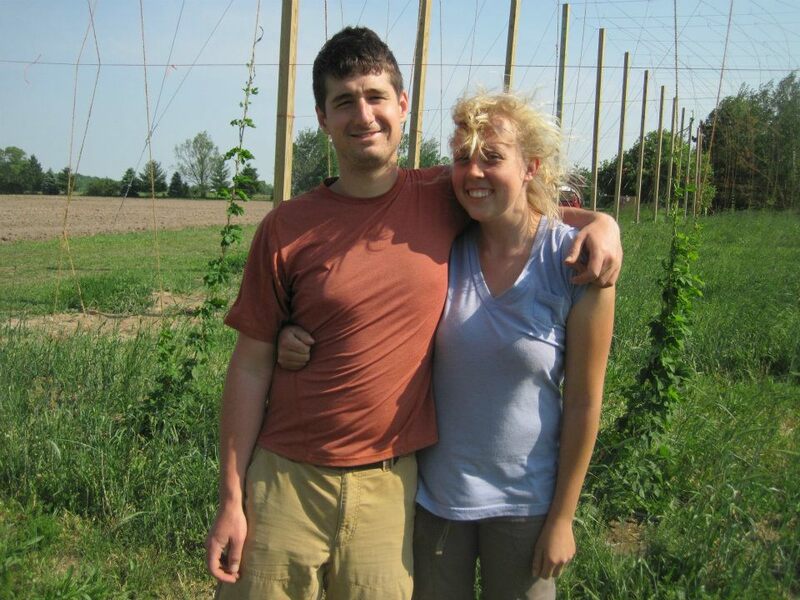 It has a very rough surface which makes it ideal for the bine of the hops bine to stick to. I was wondering where it came from and how it was made and I was very surprised to see an episode of The Amazing Race on CBS in May, where contestants had to spin coir rope in India as one of their challenges. It was very difficult for them and their hands were very sore. It looks as though coir rope is spun by women in dark hot sheds in India. 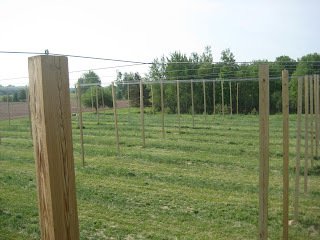 Yikes, I can't get that image out of my mind as I am uncoiling the strands we are about to use in our hop yard. 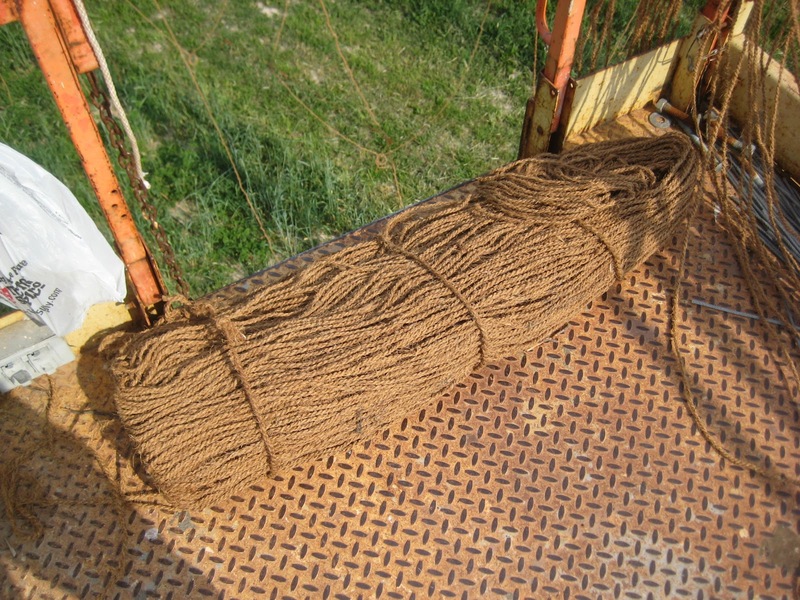 The rope comes in a large bale and the bale contains sections of 20 ft. lengths, 100 per section. 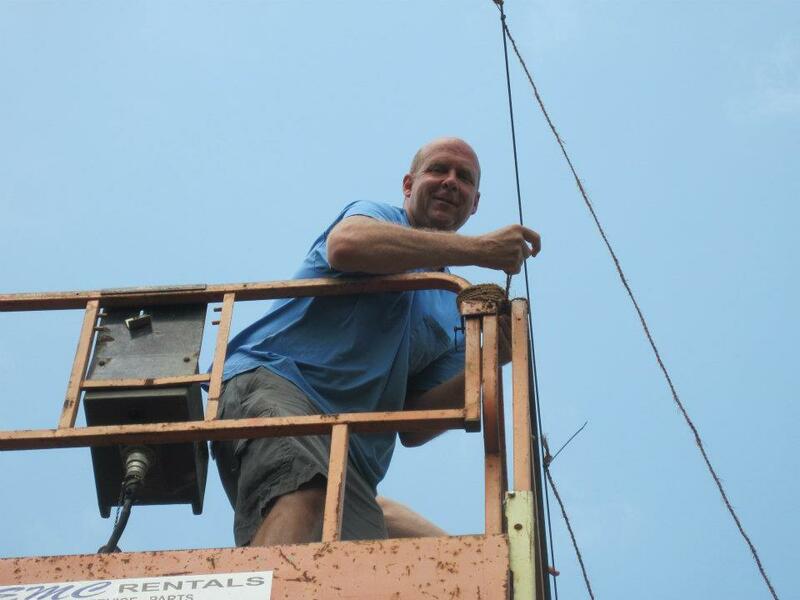 We load the string sections on the scissor lift and go up for a ride to the top of the trellis. 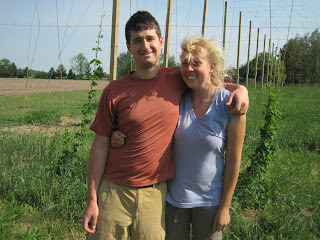 We got about half of the ropes up on our acre hopyard and the winds came. 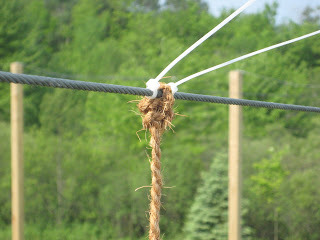 With no crew on the ground to attach the strings at ground level we had to come down from above and tie down the strings before a huge tangle was created. The wind was so strong, it was not safe to go back up in the lift, so we postponed stringing until the following weekend when the family would be visiting again to help. Well, at least I think Howie was helping....but maybe he was just tormenting his little sister. Thank goodness for our family. The job was finally finished on Memorial Day weekend.